A great beginner kit, and a quality all-mesh option for more advanced drummers looking for a simple and quiet practice kit. In short: The module is definitely not powerful, but the Roland TD-1DMK does come with some great features usually only found on more expensive electronic drum kits. Let’s get right into it… the TD-1DMK has all mesh snare and tom drum pads, which is super cool. Mesh pads are quieter than rubber pads, and they feel better when you play them. This is a huge plus for the TD-1DMK, since many other low-price electronic drum kits usually feature basic rubber pads. There’s nothing inherently wrong with rubber drum pads, but mesh pads are a very nice improvement. When it comes to the number of drums, you get the standard snare-and-three-toms setup, which will satisfy most drummers out there who don’t need a Terry Bozzio sized kit. The mesh pads are dual-ply (two layers of mesh), making them tough enough to never need replacing. The 8″ snare drum pad has two trigger zones (so you can get two different sounds out of it), and the three 6″ toms have single zones. These mesh drum pads feel great when you hit them, and you can “tune” them with a drum key to change how much stick rebound you get. Overall, these mesh pads are one of the highlights of the Roland TD-1DMK, and they really make this kit stand out from other electronic kits in this price range. Both single and double pedal drummers will be happy here, as the TD-1DMK’s rubber bass drum pad allows for both types of pedal. The “bass drum” on the Roland TD-1DMK is not actually a full drum pad; instead it’s a small soft oval-shaped pad with just enough space for the beaters to hit. This is a bonus when it comes to the amount of space you need for this kit, since you don’t have to factor in a larger kick drum tower. The only downside to a rubber bass drum pad is that you’ll get more noise compared to a mesh bass drum. However, mesh bass drums are not really an option at this price range (for comparison, Roland’s KD-140 mesh bass drum pad is worth more than this entire kit!). To cut down on bass drum noise, you can use a very soft bass drum beater (like Vater’s Vintage Bomber here), or simply wrap a towel around the bass drum pad to soften the impact. In most cases though, the noise generated from normal use shouldn’t cause too many problems. It’s noticeable, but not overly loud. Overall, the bass drum pad on Roland’s TD-1DMK is another standout feature in this price range. 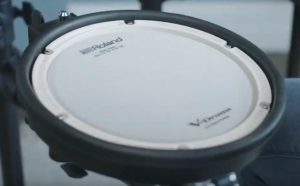 Along with being double bass pedal compatible, it’s great that Roland have included a real bass drum pad here. Many other kits in this price range have a pad-free pedal only, so you can’t actually use a real bass drum pedal. Great work by Roland! Roland’s TD-1DMK has two rubber cymbal pads (a crash and a ride), along with a rubber hi-hat pad. These cymbals are responsive and play well. All of the cymbals are dual-zone, allowing you to hit the bow or the edge to get different sounds. 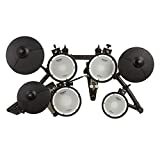 You can also grab the edge of the cymbals to choke them, which is a nice feature for this price range (some other electronic drum kits don’t allow this). 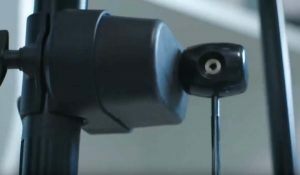 The hi-hat is controlled by a separate pedal, which allows for open and closed sounds. There’s also an extra pad input available, in case you want to add an extra cymbal pad in the future. The frame holding everything up is solid, stable, and similar to the drum frame of the more advanced Roland TD-17 series. In terms of adjustment options, the TD-1DMK’s frame allows for a moderate amount of adjustments. You can easily change the height and placement of cymbals, you can swivel the drums (especially the snare), and it caters for most standard drumming setups. The bass drum pad’s height can also be adjusted. There’s nothing amazing happening here, and maybe you won’t get everything exactly where you need it (if you’re super picky), but it does the job. 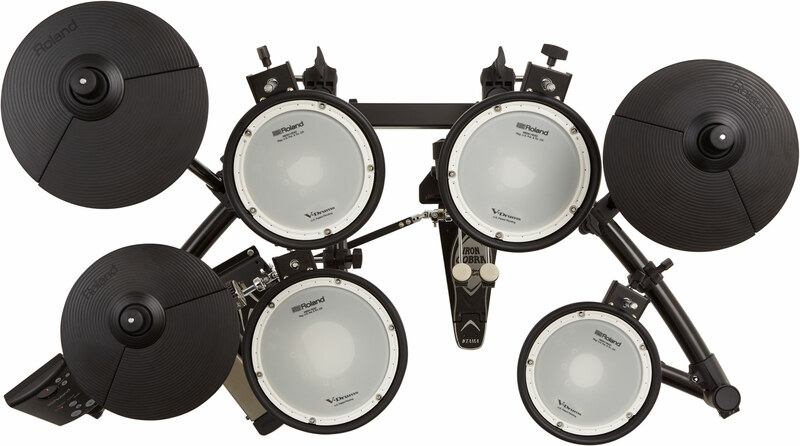 Roland TD-1DMK Features: What Can It Do? Roland is squarely aiming this electronic drum kit at beginner drummers, so we’ll cover this first. More advanced drummers should keep reading as well though, especially if you need a great practice kit that covers all of the essentials. The features Roland have included on the TD-1DMK are definitely aimed at the beginner market. There are no advanced options, no super-customizable settings, and nothing really ground-breaking when it comes to drum sounds. What you do get is a very well-built kit, great drum pads, and an excellent starting point that will last many years. There are also some high quality features specifically designed to help you learn the drums, and these are perfect for beginners. If you’re just starting out, the Roland TD-1DMK is an excellent choice that you won’t outgrow for many years. When you do move into more advanced drumming territory, the TD-1DMK will likely become your go-to practice kit. Some of the nice features include an auxiliary input, allowing you to plug in your own music and play along to your favorite bands. This definitely makes practice much more fun, especially for younger drummers (tip: do your rudiments to music rather than a boring metronome!). There are also 10 different coaching features and 15 built-in backing tracks for you to use. Both of these functions will help you build up your drumming skills. 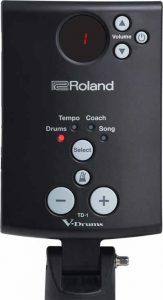 They’re easy to access, and Roland have included enough variation to keep even intermediate drummers on their toes. There’s also an app (called Melodics) which has even more learning features, covering everything needed for both beginner and intermediate drummers. The Melodics app is interactive, with games and other cool features to help you get your skills up and have fun at the same time. Is the TD-1DMK useful for intermediate or advanced drummers? In short: Yes it is, but it won’t become a replacement for your acoustic kit, and it’s not really suitable for a gigging kit. It is a great practice kit though. 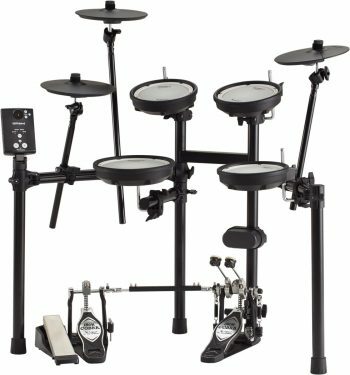 If you want an all-mesh electronic drum kit for quiet playing in an apartment or dorm, the TD-1DMK is a top choice. For the price, it’s hard to beat… Mesh pads, double-pedal playability, and a decent range of preset drum kits. Advanced drummers will feel at home playing the TD-1DMK, as long as you don’t expect advanced features from the module. One key limitation is the lack of customizability when it comes to drum sounds. The TD-1DMK module powering everything is quite restricted: You get a choice of 15 drum kits, and that’s basically it. You can’t edit the sounds, you can’t edit the kits, and you can’t mix-and-match samples like most other electronic drum modules. This isn’t necessarily a bad thing if you just want a practice kit. The built-in sounds are excellent, and they cover a wide range of musical styles. If you need more customizability though, you should look elsewhere. 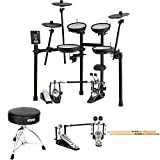 The 15 built-in drum kits include a good range of different acoustic, percussion, and electronic kits. There’s rock and hard rock, a jazzy bop kit, reggae, percussion, pop, and some different electronic drum sounds. These are the standard “essentials” that you’d expect from any electronic kit. They cover most styles of music, they’ll inspire you to play new ways, and they’ll give you some fun options to enjoy. Compared to most other electronic kits though, there’s definitely nothing ground-breaking happening with Roland’s TD-1DMK, and you cannot create your own kits from the built-in sounds. You’re simply limited to the 15 preset kits, and that’s it. When it comes to effects, some of the built-in drum kits have extra reverb added, while some are much more dry (and this can’t be changed either). One thing you can do is change the volume levels of each drum and cymbal, which helps with getting a more personalized balance. Overall the module is very basic compared to a lot of others, but it has enough to keep you happy for a long time if you’re learning or practicing. What it does, it does well. The positive side of this really basic module is that it’s super simple to use. 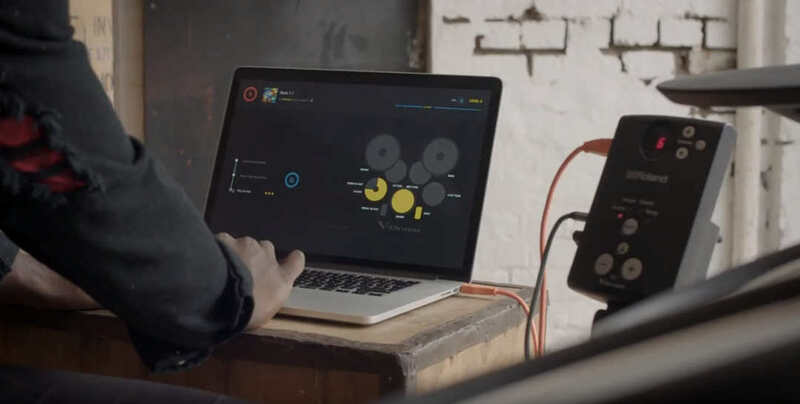 You can plug in and be playing drums within a few seconds. The options are clear and easy to use: There are volume controls, a metronome button, big buttons to switch between kits (these big buttons are nice, as you can use your drumsticks to push them), and a “select” button to cycle between different features. It’s worth mentioning that you can use midi via USB to trigger different sounds if you need to. You’ll obviously need a computer to do this, so it adds an extra step to actually triggering your own samples, but it is possible. Beginners have a great range of features, without things being too complex or overwhelming. Advanced drummers can use this as a top-notch practice kit, and for this purpose it really does everything you could ask for. For these two reasons, it’s especially great for beginner drummers since this kit is definitely worth keeping as you improve as a drummer. The TD-1DMK is not just a beginner-only electronic drum kit. If you do grow tired of it, the mesh pads on the TD-1DMK mean this kit will have a good resale value if you want to sell it. In terms of upgrades, you can add an extra cymbal pad if needed. You also have the option of buying a completely different drum module if you really want to upgrade the sounds and features. Since all of the drum pads are mesh with the Roland TD-1DMK, upgrading the module is actually a more viable option compared to most other cheaper electronic drum kits. Once you get into more advanced territory, you’ll definitely want mesh drum pads, so starting out with them here is a big plus. Keep in mind that replacing the drum module is still quite an expensive thing to do, so you might be better off looking at a more powerful kit right from the beginning if you think it’s likely you’ll end up replacing the TD-1DMK’s module. 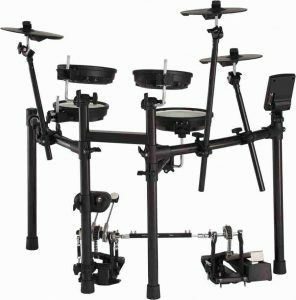 Roland TD-1DMK: Is it a quiet electronic drum kit? One of the key reasons people bue electronic kits is due to the sound, so this wouldn’t be a real review if the noise factor wasn’t covered. The TD-1DMK’s mesh snare and toms definitely cut down on a lot of noise compared to other electronic kits with rubber pads. The rubber cymbal and bass drum pads do give a bit of noise when hit, so keep this in mind. However, unless you’re willing to shell out thousands on a top-of-the-line electronic kit, there’s really no escaping this extra noise. As long as you’re not belting the hell out of this kit, your neighbours shouldn’t complain. If you really need to cut down on extra noise, take a look at our guide to reducing drum volume. Overall, the TD-1DMK gets the tick of approval in the “quiet” department, mainly thanks to the mesh drums. Should you buy the Roland TD-1DMK? It’s a very fun kit to use, and the super fast plug-and-play simplicity of the module will be a winner for many drummers who don’t need any advanced features. The simplicity also makes the Roland TD-1DMK a great option for younger children, and the built-in coaching features (and app) also hits the mark for younger drummers as well. The Roland TD1-DMK is missing some key features due to its more basic drum module, but what is does have, it does very well. The ability to connect it to the Melodics app also scores the Roland TD-1DMK some extra points. 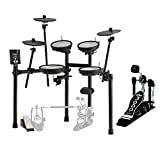 This is a kit that can grow with you, as you transition from beginner into a more advanced drummer. It’s not suitable for live shows or advanced electronic drumming, but this probably isn’t the reason most people are looking for a kit in this price range. If you’re on a budget, you’ll definitely be happy with this kit. 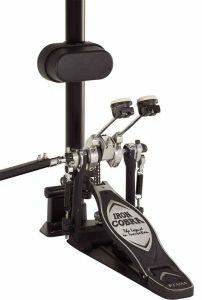 It stands out from the other cheaper options due to the real bass drum pad and mesh heads, making it a great investment for drummers looking for quality on a budget. Check the latest price of the Roland TD-1DMK here, or see it on Roland’s website. If I buy the Roland TD-1DMK, what else do I need? A drum throne: Roc-N-Soc are great thrones (see our review here), otherwise any cheaper throne (like this one) will do. A Bass drum pedal: See here for our ultimate pedal guide! Drumsticks: 5A size sticks (like these) are the best option if you have no idea which ones to get. Headphones: You’ve probably got some at home somewhere. If not though, we recommend these.